After five decades of helping drummers hone their unique sounds, cymbal guru Lennie DiMuzio has written what will undoubtedly become known as the “Beat Bible”—a be-all, end-all book detailing the adventures (and misadventures) of the greatest drummers of the past century. Why him? Because he was there. On the surface, Tales from the Cymbal Bag is a love letter from Lennie DiMuzio to the many members of his extended family known as drummers—not to mention people who just dig a good backbeat. But a closer look reveals that, at its core, Tales from the Cymbal Bag is the story of one man who was lucky enough to live what he loved every day and whose grand adventures brought him into contact with icons such as Buddy Rich and Max Roach—all of whom, as it turns out, thought Lennie was pretty iconic, too. If you’re not a drumming aficionado, you may not be familiar with the importance of cymbals. Don’t worry; Lennie will enlighten us in a minute. But first, a brief history lesson. As Tales from the Cymbal Bag points out, cymbals were among man’s earliest instruments. They’re thought to have existed in the Middle East for at least three thousand years; even the Bible references cymbals in Psalm 150. It’s a rare gift that can be traced back to his family. Lennie grew up in Cambridge, Massachusetts, in a house overflowing with three generations. What they lacked in money, they more than made up for in musical talent. His mother sang and played ukulele, while his uncles played everything from saxophone to clarinet to banjo. One of his uncles, a tap dancer who also dabbled in drums, saw that his nephew was similarly inclined. 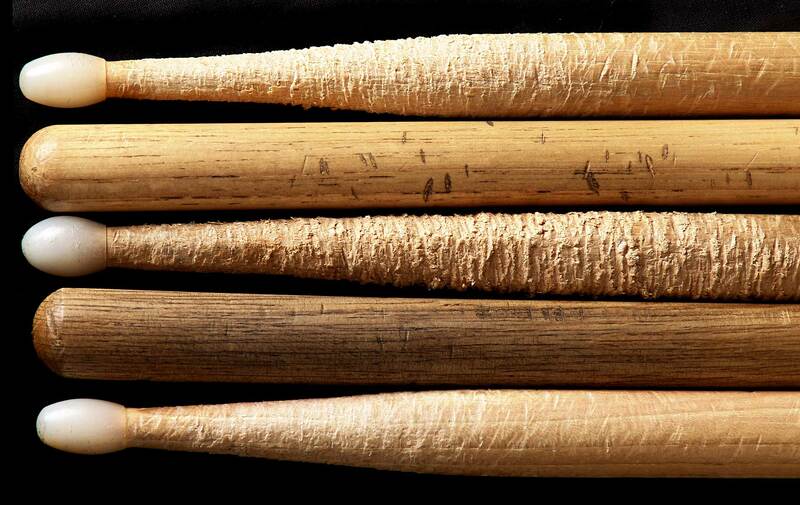 With no money for a real drum set, Lennie’s uncle broke rungs off an old chair and whittled them down to make a pair of drumsticks. Lennie was soon wailing on his first kit, which consisted of a washboard, cookie sheets, pie tins, and a couple of bicycle horns. Before long, Lennie and his saxophone-playing brother, Eddie, were performing in minstrel shows around New England and founding their own bands. Their steady rise was put on hold when the Korean War came calling, first for Eddie and then for Lennie. Even wartime couldn’t stop Lennie’s drumbeat, though, and he earned a spot in the Army band during his last year of service in Germany. A transfer to the Schillinger House (now Berklee College of Music) allowed him to pursue a performance degree during the day and play with a band at night. During one of these gigs, he met Armand Zildjian, the son of Zildjian cymbal company owner Avedis Zildjian. The two hit it off immediately, and when Lennie inquired about openings at the company, Armand invited his new friend to meet his father. That meeting launched a forty-two-year career that took Lennie on the ride of his life. Though it was—and still is today—among the largest cymbal companies in the world, Zildjian was a fairly small company when Lennie came on board. Its size allowed Lennie to dip his toe into nearly every aspect of the business and rise to the top quickly. He was so enamored of this new career that he turned down the opportunity to audition for the legendary Woody Herman band, a move that took even Lennie by surprise. While working in advertising and promotions, Lennie hatched a win-win strategy for Zildjian and the drummers the company worked with. He gave the artists the opportunity for publicity through print materials, clinic instruction, and performances. In return, they signed an agreement allowing Zildjian to use their names in its advertising. Innovative ideas aside, Lennie’s main area of expertise has always been cymbals and the drummers who use them. Thousands of drummers came through the Zildjian factory during Lennie’s four-decade tenure, and he built relationships with most of them. These were his people. This was his craft. And he was their go-to guy. He modestly says that he met all the great rock drummers, but he did more than meet them. Lennie characterizes Aerosmith drummer Joey Kramer as “a good friend” of three decades. He’s longtime pals with David Lee Roth drummer Gregg Bissonette, with whom Lennie made some backstage memories that were nearly too risqué to put in his book. And then there was the time Lennie merrily shoved a lemon meringue pie in the face of Red Hot Chili Peppers drummer Chad Smith—just because. The connections he cherishes most are the enduring ones—like his twenty-five-year friendship with Rush drummer Neil Peart. Peart, whom Lennie calls “a wonderful person and an excellent musician,” is considered one of the best rock ’n’ roll drummers of all time. He’s also a big fan of Lennie, even following him to the Sabian cymbal company ten years ago when, after a brief retirement, Lennie decided he wasn’t done with the business quite yet. Poor, popular, in-demand Lennie—he was incredibly busy. And he loved every minute of it. “Being accepted as a close friend, given front row seats to their performances, having conversations where we talked about everything in the music business, and then helping them pursue their sound and their identity—that was the best part of the job,” he says. It also makes for a great book. Lennie seems to have encyclopedic knowledge of every drummer you’ve ever heard of—and most of the ones you haven’t. Lennie knows, for example, that Whitesnake drummer Tommy Aldridge taught himself to play drums by mimicking Ringo Starr and Jimi Hendrix’s drummer, Mitch Mitchell. And that Ginger Baker, drummer in the classic rock band Cream, dreamed of becoming a professional cyclist but got a job in a band the first time he sat down at a drum set. This PhD in “drumology” didn’t come from a book. It’s the result of time spent and relationships built—not to mention adventures so unbelievable that they have to be true. Luckily, nearly all of them are recorded in Tales from the Cymbal Bag. Included in the book is everything from how cymbals are made to stories like catching Frank Sinatra in the middle of a self-pep talk before a show. And the pictures. Oh, the pictures. Between Lennie’s always-ready camera and “chronicler of the drumming world” Lissa Wales, to whom the book is dedicated, they captured thousands of “right time, right place” photos. This visual feast of Lennie with his legions of famous friends and of iconic musicians performing and picking out cymbals at Zildjian makes readers feel like they were there, too. Yep, he goes there. All the way there. Lennie doesn’t apologize for shooting straight, and why should he? These are his stories, after all. Not surprisingly, the experiences that are most memorable to him involve two of the greats: nice-guy Gene Krupa and obnoxious Buddy Rich. Lennie credits Krupa with being among the first to bring drums from the back of the stage to the front, featuring them as an instrument rather than just a timekeeper. “He gave the drums identity and personality,” Lennie says. Krupa’s close friend (and biggest competitor) Rich, however, was in a category by himself. And not just because he could be insufferable. “He was a man from another planet; I believe we’ll never see another player like Buddy,” Lennie asserts. He was a genius. He never read music, but he could hear something once and remember it forever. His playing was so far superior to anyone else’s, and he developed a style that lives on in every drummer today. Tales from the Cymbal Bag also shines the spotlight on people who may not be famous, but who mean the world to Lennie—like his best friend, the late Armand Zildjian. As Jim Coffin writes about the twosome in the book, “You saw one, you saw the other.” Lennie says it was an honor to spend so much of his life working and playing with Armand, whom he calls his inspiration and the reason he has this treasure trove of memories. The kind of guy Lennie is can be found on every page of Tales from the Cymbal Bag. You’ll meet a passionate man who has made a real difference not only in his children’s lives, but also in the lives of countless drummers. Ironically, the man who turned away from teaching may go down in percussion history as one of the greatest teachers ever—the kind who didn’t give you the answers, but who helped you find them yourself. You may request an autographed copy of the book by contacting Lennie DiMuzio by phone (781-837-8439) or by email (cccandbear@aol.com).